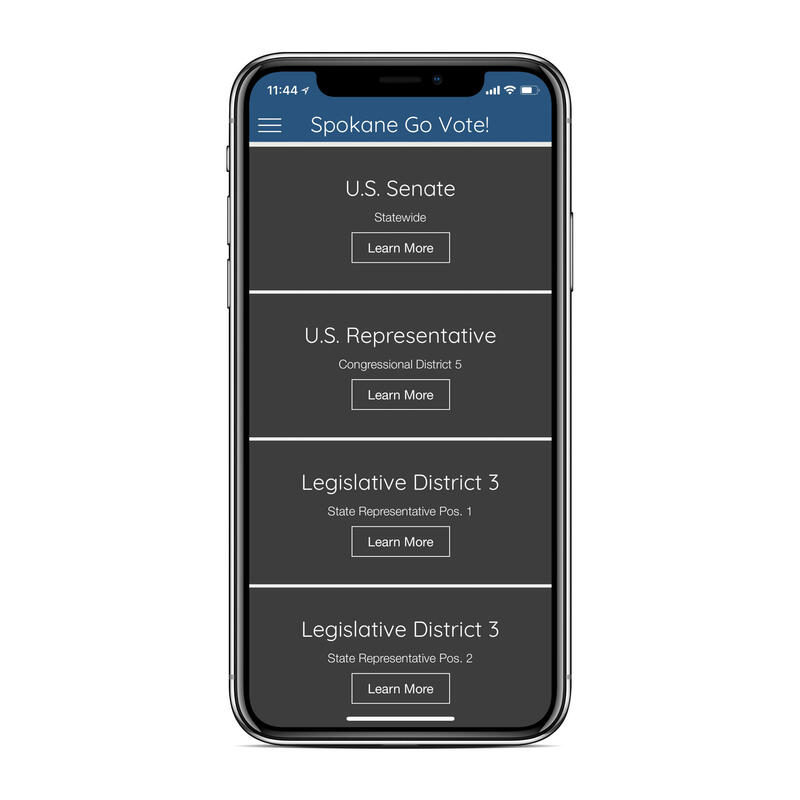 The new Spokane Go Vote app was developed to help voters learn about candidates running in the November election. Spokane Public Radio's Jared Brown reports. The way Spokane County voters get information about candidates for elected office is changing. A 2018 county commissioner candidate has created a new way for constituents to pose questions to candidates via their smartphones. Robbi Anthony is an app developer by trade and a rookie politician running for Spokane County commissioner. The fruit of both endeavors launched on the Google Play mobile app store earlier this month. It’s called Spokane Go Vote! It’s an application developed by Anthony’s Spokane-based tech company Firedove and paid for by her campaign. It is a nonpartisan voter guide via smartphone at its least. At its best, it’s a political town hall in your pocket. "When you first fire up Spokane Go Vote! you see all the candidates from the federal seat all the way down to the county seats. But, the real magic of Spokane Go Vote! is when we click on the menu here and there’s a place where people can submit questions," Anthony said. Questions submitted by constituents will be sent out weekly to the email addresses candidates provided when they filed for office. When submitting a question, users have to enter their zip code so candidates with jurisdiction over the area can answer. Otherwise, constituents can remain anonymous, but there are optional slots for a name and email to receive candidate responses in real time. Anthony said the app was inspired by the “opt-in” digital campaign she has been running. "This is just an honest and sincere effort to get the information out that people want and just try to do right by the people of Spokane County," she said. To show transparency and good faith, Anthony said the app maintains a log to show when questions and candidate answers have been updated. Candidates also have an email record of the questions submitted to them and the answers they send in. "And even though I am a candidate, even though my name is on this app, I have nothing to gain by trying to manipulate it. And, I’ve honestly hardwired it to make it almost impossible for me to do that," Anthony said. She also keeps submitted questions in a digital “black box” so she doesn’t see them until the day they’re sent out to each candidate. The app has sections to provide feedback. You can also register to vote through the state’s MyVote portal. Anthony said the response from candidates and constituents has been positive so far. To spread the word about Spokane Go Vote!, she has reached out to local media and plans to run digital ads. Anthony said the app will launch on the Apple iOS App Store soon, but is unsure of a firm release date. After the campaign, she said she hopes a nonpartisan group will take over management of the app.